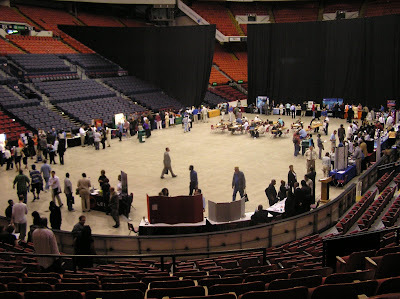 The next big job fair in Pittsburgh will be held July 25th at Mellon Arena. You'll get to come right down onto the floor where the Penguins play. We expect about 35 companies and schools to be in attendance. This includes Achieva, Cintas, Presbyterian Senior Care, Advance Auto Parts, Community College of Allegheny County, All-State Career School (CDL Driver Training), Maronda Homes, Army National Guard, Best Buy, Sunrise Senior Care, Sheet Metal Worker Training, PNC Bank, Pennsylvania State Police, The New AT&T (formerly Cingular), The City of Pittsburgh, Transitional Services, Echostar, Equitable Resources, New Century Careers (Machinist Training), FBI, First Student (School Bus Drivers and more), Mainstay Life Services, Lenzner Tours, Giant Eagle Market District, Goodwill, Home Depot, Medco, SMG/Mellon Arena, Yellow Cab, Pharma Care, Cardworks Servicing, Holy Family Institute, Carniegie Mellon University, East End Employment Services, Leed’s Business Accessories and more. Access is easy by either public transportation or direct parking in one of the arena lots (parking will range from $5.95 to $7.00 depending on which lot is used). All job seekers enter through gate one (by the will call windows). It is strongly suggested that you bring plenty of resumes. Proper attire is required (remember, you are trying to make a good first impression!). Admission is FREE and there is no pre-registration required. Just come on in, meet with company or school representatives, smile, shake hands, ask questions and make a good impression! For more details on what positions are available pick up the latest issue of The Employment Guide. Job Fairs are a great place to research companies and the opportunities they offer. Hey, you never know who else may be hanging around the arena! In what is being billed as the largest general public job fair in Pittsburgh’s history, an announcement will be made soon about a tremendous opportunity for hourly workers in the Pittsburgh region. 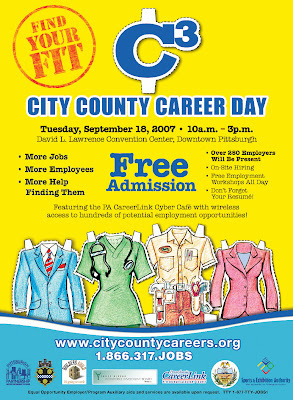 Under the coordination of the PA Careerlink and endorsed by Pennsylvania Governor Ed Rendell, Allegheny County Executive Dan Onorato and Pittsburgh Mayor Luke Ravenstahl, City County Career Day (or C3) is projected to have over 250 companies in attendance offering thousands of job opportunities. The main focus is on the building trades with participation from most major unions offering information on apprenticeship programs and direct employment. The event will not be limited to only building trades and will include career opportunities in most job categories. C3 will be held at the David L. Lawrence Convention Center from 10AM to 3PM and also offer multiple seminars on resume writing, interviewing skills, career training advice and much more. We will post more information in the weeks to come so be sure to check back. Each week we chose our Hottest Employer of the Week based on number of positions available or difficulty in filling available positions. Either way it means a good opportunity for jobseekers. This week our hottest employer is SAE (Society of Automotive Engineers) International. SAE International has more than 90,000 members - engineers, business executives, educators, and students from more than 97 countries - who share information and exchange ideas for advancing the engineering of mobility systems. SAE is your one-stop resource for standards development, events, and technical information and expertise used in designing, building, maintaining, and operating self-propelled vehicles for use on land or sea, in air or space. Their international headquarters in Pittsburgh’s north hills is looking for Telesales Representatives for full time long term careers. For more information and to apply go to their website or pick up a copy of this week’s The Employment Guide. This includes Achieva, Cintas, Presbyterian Senior Care, Advance Auto Parts, Community College of Allegheny County, All-State Career School (CDL Driver Training), Maronda Homes, Army National Guard, Best Buy, Sunrise Senior Care, Sheet Metal Worker Training, PNC Bank, Pennsylvania State Police, AT&T Wireless (formerly Cingular), The City of Pittsburgh, Transitional Services, Echostar, Equitable Resources, New Century Careers (Machinist Training), FBI, First Student (School Bus Drivers and more), Mainstay Life Services, Lenzner Tours, Giant Eagle Market District, Goodwill, Home Depot, Medco, SMG/Mellon Arena, Yellow Cab, Pharma Care, Cardworks Servicing, Holy Family Institute, Leed’s Business Accessories and more. 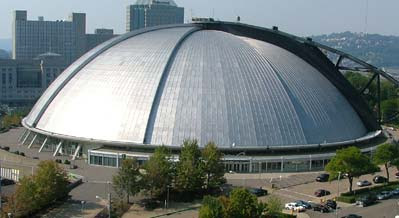 Access is easy by either public transportation or direct parking in one of the arena lots (parking will range from $5.95 to $7.00 depending on which lot is used). It is strongly suggested you bring plenty of resumes. Proper attire is required (remember, you are trying to make a good first impression!). Admission is FREE and there is no pre-registration required. Just come on in, meet with company or school representatives, smile, shake hands, ask questions and make a good impression! For more details on what positions are available pick up the latest issue of The Employment Guide. Job Fairs are a great place to research companies and the opportunities they offer. Hey, you never know who else may be hanging around the arena! Recently Comcast Cable in Pittsburgh started a new service for their subscribers called Classifieds On Demand. If you have their digital package, you are probably familiar with ON DEMAND for movies and other programming. This allows you to watch at your convenience and even pause, fast forward and rewind. Now you have the ability to view classifieds ON DEMAND as well. The main categories include automotive, real estate and employment (help wanted) ads. The Employment Guide will be sharing content from our weekly print and Internet job board to help increase visibility for Pittsburgh area recruiters and help job seekers find a better local job. Over the next few months you will see more content presented in an easy to scroll format in video. If you see something of interest you can pause or rewind to write down the “Job Snippet” number on the ad and jump on the Internet at www.pittsburgh.employmentguide.com. When you input the snippet number from the Comcast Classifieds ON DEMAND ad it will take you directly to that employers text posting for more details and how to apply. We at The Employment Guide are very proud of this partnership and look forward to the added value that will be given to both recruiters and job seekers. This week’s hottest employer, based on severity of need or number of needs is the New AT&T (formerly Cingular Wireless). No doubt with the rollout of the latest über-phone, the Iphone, The New AT&T is ramping up sales and needs Retail Sales Consultants in multiple Pittsburgh area stores. For details on the position, pick up this week’s edition of The Employment Guide, or visit http://www.pittsburgh.employmentguide.com/.